These sound familiar? If so, then you’ve found yourself around a few craps tables in your day. One of the most iconic, and certainly easiest games to play, Craps is a staple in both land and online casinos. We’ll take a look at the different bets, systems, and rolls that go on during a Craps game and help you improve your craps game over night. 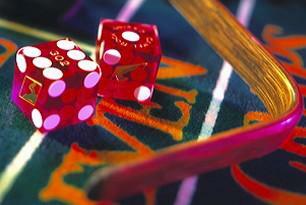 Much like roulette, Craps allows the player to make money on a gradual scale or in a big splash. The pass/don’t pass bets is very similar to a red/black bet in roulette in terms of odds and payout. If a player is looking to make a big splash, there are betting options that can payout 30:1 and make you a big-time winner. The Martingale System can come into play here, but comes with inherit risk. The chance of possibly losing all your money by hitting a losing streak is plausible, and the chance of making huge money is dependent on your initial bet. The other common system is the “Gambler’s Fallacy”, which plays off a gambler’s perceived thoughts on probability. For example, if an easy ten was just rolled, the gambler will assume it won’t be rolled again for a while, thus factoring that into his future wagers. Realistically, all rolls are independent and this common system is flawed. Having a set strategy in Craps is difficult if you’re using it to make a ton of money. Blackjack, slots, roulette, and poker all have ways to make money, but Craps is more difficult due to the random nature and human element. This table will outline all the different roll combinations in Craps, along with their names. Of all the casino games, Craps has the biggest disparity in terms of what it’s like at a land casino compared to what it’s like online. The plus side is that no table etiquette is required and you can’t embarrass yourself by not rolling properly. The only downsides are you miss some of the commotion and energy from a live Craps game, which can be both exhilarating and intimidating all at once. There’s a bit of give and take here, but the player can still get a good Craps experience online.